Genevieve Beaumont is haunted by dreams of a drowning man she is helpless to save. 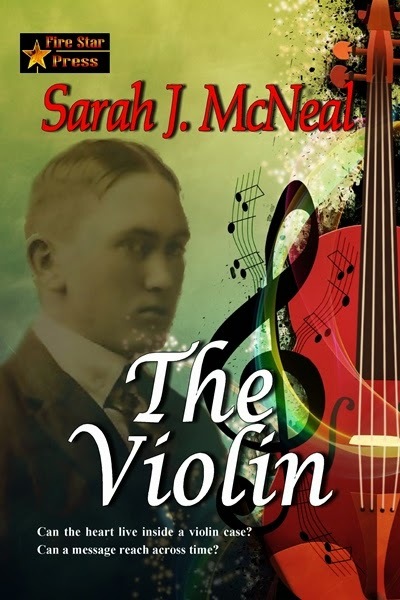 When she buys a violin and discovers news clippings and pictures of its owner and how he died from downing, she knows he must be the man in her dreams. She travels to the little town where he died 90 years before to investigate who he was and how he died. Little does she know how her own life is tangled in the mystery…until she steps through the threshold of time to 1927. Available in paperback and all e-book formats including Kindle at Amazon, Smashwords, KOBO, and Barns & Noble. John took her hands in his and just stared at her for the longest time before he spoke. When he did speak, his voice sounded raw, almost sad. "Remember me," he said softly. He took a little shaky breath and hesitated. "I mean remember that day after tomorrow you're coming to the house to help Mama bake. I'll meet you here about noon and walk with you to the house. Maybe I could take you for a ride on my motorcycle after all that baking." He grinned, and it warmed her. He has a beautiful smile, Genevieve thought. "Unless something prevents me, I'll be here." She didn't want to leave him here. God knew what was around the other side of the curve. She might never be able to get back, might never see John again. Her heart sank like a stone in her chest. She wanted to say something, but words wouldn't come to her. As if he sensed her dilemma, John pulled her to him and laid his cheek on the crown of her head. "Don't worry so much, Genevieve. Everything's going to be all right." He said it with quiet reassurance, like an unspoken promise. When I think of Easter, it takes me back to the years growing up with Mom, Pop, and my older sister. Often times, when the weather was good, we would move the Easter dinner to the orchard. Does food taste better when it's eaten in the out of doors? It seems that way to me. It felt lazy and festive at the same time. Mom made my sister and I Easter baskets long after we were grown. She loved holidays and made certain we celebrated with her. I didn't realize until after she died how much she contributed to our happiness on holidays. But I sure do appreciate all the memories she gave us in the time we had with her. Mom made chocolate covered Easter eggs, some coconut, some peanut butter, and cherry. I can still remember how good they tasted. Of course, we made dyed Easter eggs. What's Easter without those? And it doesn't take much skill to make them, so I was all into that. I still have my old Easter basket and some of the fuzzy chicks with hats she included in it over the years. It's kind of worn and the chicks have tattered, but it brings back those wonderful memories of home. Parents may have no idea how important the memories they help create are to their children. 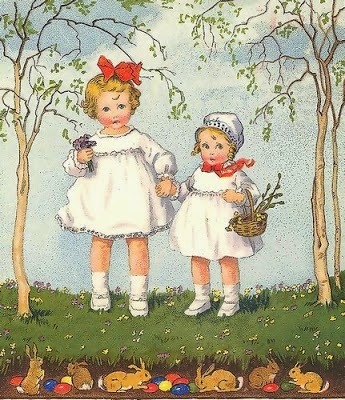 All grown up and looking back, I still hold dear those cherished memories of Easter in the orchard and baskets full of delight my parents gave to us. I hope all of you have a wonderful day today celebrating with your loved ones, both family and friends creating memories that could last a lifetime.